During Columbus Museum of Art’s biennial Art in Bloom, April 26-29, 2018, floral designers bring the galleries to life reinterpreting art through flowers. We sat down with floral designer Scott Robertson to talk music, flowers, fashion, and Monet’s garden. As part of the April 27 program Symphony in Bloom, you’ll be creating arrangements accompanied by the Columbus Symphony. How does music inspire your design? How can people go about bringing a touch of Monet’s garden into their life? There are many ways, but firstly call your local florist and talk to them about your vision and allow them to create something original for you, using the colors of a Monet painting. 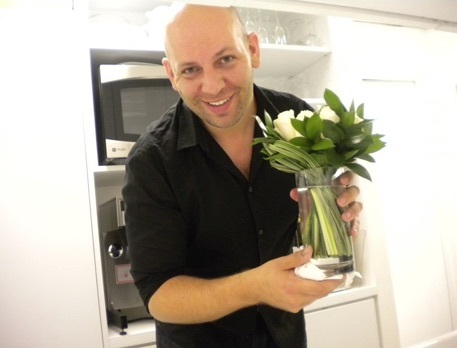 Treat yourself once a week or once a month to stunning fresh-cut flowers. You could also start to plan your garden designs around the colors Monet would use in his paintings, and even some of the same variety of plants. If planned properly, your garden can give you three glorious seasons of Monet colors. Another way that comes to mind, is choose a room in your home you would like to have for some serenity, and paint a wall a soothing shade of Monet blue. Add accessories in monochromatic color tones so you feel as if you were IN a Monet garden painting. You’ve been successful in merging floral and fashion in the past. What suggestions do you have to help guests prepare their outfits for Fashion in Bloom? For a fun event like this, I suggest COLOR COLOR COLOR! Use bright, saturated, monochromatic outfits so you stand out in the crowd, but also BECOME part of the art show! What’s your favorite part of Art in Bloom? My favorite part is no doubt watching people enjoy, explore, and experience each design by all of the phenomenal floral artists CMA has asked to be a part of such a wonderful show. I love to see how other florists have interpreted the artworks they’ve been paired with! Can you give us a hint on what your floral installation may include? Imagine an 8’ square metal structure with over 800 hanging glass test tubes…. And thank you to Dümmen Orange for partnering with me, and their dedication to the arts. Their plants and flowers bring joy to millions of people around the globe. Scott James George Robertson is an Ohio native who, since early childhood, has loved gardening, decorating, and art. Since then he has been designing with flowers and art for more than 25 years and has worked in Miami, New York City and now back to Cleveland where he started his own company STEMS FLEUR “The Flower Stems.” While in NYC Scott was privileged to work with Olivier Guigni for 5 years before opening his own design studio where he did work for Carolina Herrera, and other high-end fashion boutiques in Manhattan. Back in Ohio he’s been designing for Columbus Fashion Week, Art in Bloom, The Cleveland Botanical Gardens Winter, Orchid and Spring shows, teaching classes, designing fun creative weddings, events and special projects. Join Scott Robertson at Art in Bloom April 26-29! 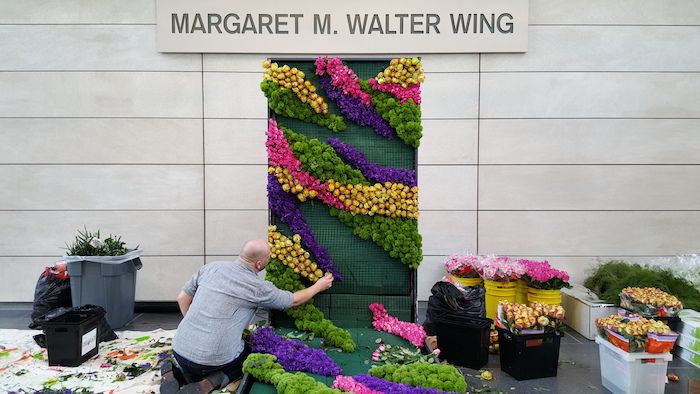 Scott will be a featured installation designer, including wearable floral at Fashion in Bloom on Thursday, April 26 and will be presenting a unique floral demonstration inspired by the art of Claude Monet during Symphony with Monet on Friday, April 27. Click here for tickets and more information on both events. Space is limited. Next Next post: Can Anyone Lead for Inclusion?